Like most good things in life, you often have to let go of one in order to gain another. Today, I let go of 25 of the most amazing children in order to gain what...travel? The decision to travel has always been easy for me, but today, I found myself questioning that decision more then ever before. How do you say goodbye to the bright, smiling faces of children you have come to know more as family, then a class? When you know each child's strengths, weaknesses; ambitions, fears; family lifestyles or lack there of? Maternal instincts have never come easy to me (failing Babysitting 101 numerous times), but for the past 5 weeks, I have been lucky enough to experience a wondrous prequel to the love a mother has for her children. Saying goodbye to fellow traveler´s met along the way will never compare to saying goodbye to my own. In Western societies, many children resist school, faking illnesses to achieve the coveted, "sick day", (we all remember those dont we), but not in Chachani. The children look forward to class everyday, running to greet myself and the other professors with airborn abrazos (hugs) and besos (kisses) on the cheeks, bursting with questions and full of stories! I guess you don´t realize the impact you've had, until you have to say goodbye. Raised with the belief that homemade gifts are the best kind, I left Chachani today with armloads of the most marvelous gifts ever received. Hallmark has nothing on these. Made from the best materials on earth, Tender Love & Care. Tears come easy to me, but not to the kids of Chachani. Raised in a world where only the tough survive and emotion is solely a form of weakness, tears are a rare oasis in their otherwise desert-like eyes. However, weakness or not, emotions came out in full force today, on their part and mine. The only person capable of easing my goodbyes, was my wonderful sister. Having a part of my real family meet my newly acquired family, was truly an incredible event. Arriving to Arequipa early this morning, packed to the brim with shoes, books, crayons, and wearing about 10 layers of jackets (trying to avoid baggage overages), she only needed 8 tiny reindeer to complete the look. Santa came early this year to the children of Chachani! Promising the children a fiesta for my last day, Alicia and I arrived with with cake, fizzy drink (as they like to call it) and gifts...your gifts. Just imagine passing out gifts to a room of anxious children. More so, imagine passing out gifts to a room of anxious, NEEDY children. What I thought would end in mayhem, commenced and concluded in the most humbling of ways. Instead of grabbing what they wanted, the children reached a group consensus for each item, ensuring that each jacket or pair of zapatos, went to the most needy child. And when it came to the cake, more then half the children immediately asked for a bolsa (bag), in order to save their slice for family, or a younger sibling at home. How many children do you know that would do that? Like most places, news travels fast, and before I knew it, the whole of Chachani was at the classroom doorstep looking for clothes and cake. Lucky for me, I have the most phenomenal friends and family back home who were able to provide enough for everyone (and a "sherpa" sister to cart it all =). And when the clothes and shoes ran out, the donation money kicked in. And when I say kicked in, I mean barrelled in! I was brought to tears, once again, when my sister presented your monetary donations. I only wish you could have seen the look on Carmen (owner of Traveller Not Tourist), when Alicia and I presented her with the donation. I have never been one to disclose amounts, but let´s just say, with your gracious donations we will be able to build a bigger, better classroom in Chachani capable of housing all the children who currently overflow from our modest abode. I can never thank those of you who donated enough for the support and future you are helping to build for these children. From the bottom of my humbled heart, Thank You! 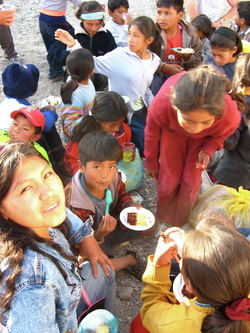 If I were leaving the kids of Chachani to a world of happiness and opportunity, the goodbye´s may have come easier, but instead, I leave them to the opposite. I find comfort in the new professors who will carry on teaching, and only hope that the small impact I may have had on their lives, reflects in their future successes. Their impact will stay with me forever.